Get a FREE 2-capsule trial box (a $12 value) when you order (2) 10-capsule boxes. Try the HPF sample box. Your satisfaction is guaranteed or you can return the 2 unopened boxes for a full refund! Free Shipping! ...for those rare occasions when you might overindulge (late night client entertaining, all-day tailgating, beer festivals, etc.) It eliminates (or significantly diminishes) the nausea and queasiness that can accompany a hangover. You may still have the headache, but advil can quickly fix that. One dose also lasts for a long weekend, so it's perfect for bachelor party or holiday weekends. I really like HPF when I travel and have to entertain clients. Don't ever stop making it! I have used this product for years. Not all the time, but when I do, it works so well! I do not have any hangover symptoms! Don't ever stop making it! My friend Bob and I are prepared. I have I admit I have been a total skeptic when it comes to HPF. I have been a fan of HPF for years! 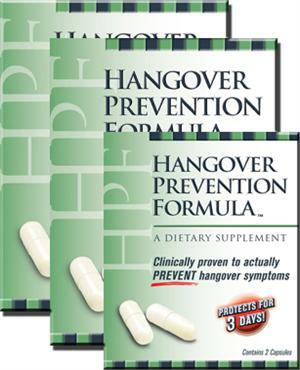 I have a history of hangovers prior to my using HPF. In the past I would wake up with an upset stomach or just feel crummy if I had one drink too many. Now, if I am going to a party or an event that I know I will drink more than my normal two, I take a HPF capsule beforehand and feel great the next day. It REALLY works for me! HPF really does work for us.